In September 2017, sewer workers in London discovered a “fatberg” made of oil and grease poured down London drains mixed with flushed wet wipes, diapers, and condoms that failed to disintegrate. This fatberg weighed in at 130 tons, the weight of about 19 African elephants, and stretched 820 feet, almost the total length of the London Bridge. Though it was cleaned out by the heroic efforts of sewer workers, a bit of the monster fatberg remains and can be seen at the Museum of London. Fatbergs, at the same time disgusting and somewhat comical, give us an insight into the alien world of the sewer networks that keep towns and cities running smoothly. Fatbergs are pretty spectacular. They can shut down an entire municipal drainage system and they can cost millions of dollars to clear. The famous fatberg pictured above is from London, but fatbergs exist everywhere, and not just in big cities. The English seaside town of Sidmouth recently discovered a fatberg of gigantic proportions. Fatburgs come at a big cost. Every year the UK spends an estimated £100,000,000 clearing away some 300,000 fatbergs created by congealed fats and waste that people pour down the sink and flush down the toilet. 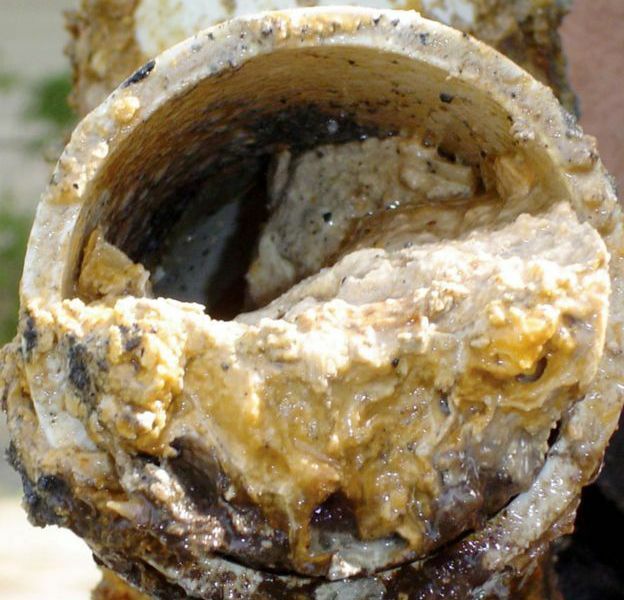 In addition to fats, diapers, so-called “disposable” wipes, and condoms are big contributors to fatberg formation. A German company, however, has taken a new approach to the removal and prevention of fatbergs. A product called Lipasan, made in south-west Germany, treats fatbergs with a micro-organism solution made with bacteria grown specifically to eat fat. Lipasan digests fat, grease, and oil. Lipasan is being used with great success in the German city of Ramstein which has a particular problem with fatberg formation, because, according to a company spokesperson, “the city has a US Military base, which has brought with it a cuisine that is traditionally higher in fat.” Military bases are infamous in the US for contaminating their surrounding areas with water polluting chemicals. Currently PFAS has drawn most attention for military water pollution, but everything from trichloroethylene to benzene to mercury have been found in abundance in waters in the neighborhoods of military bases such as Camp Lejeune, NC. Perhaps fatbergs can be added to the list of the side effects of the military. According to Dr. Andrea Junker-Buchheit, a lead scientist in the creation of Lipasan, “We treat fatbergs with a special micro-organism solution. We grow bacteria which have been developed specifically to eat fat. They digest all the fat, all the grease, all the oil.” The bacteria eats fat, and needs more and more of it to survive and grow. The application of Lipasan consists of the use of dosing pumps to inject specific amounts of the bacterial solution into the pipes of the water treatment plant. The injected bacteria keep the pipes clean and fatbergs under control. Although preventive treatment with fat-gobbling bacteria is not cheap, the cost is only a fraction of that of clearing fatbergs from pipes using conventional means. More about fatbergs from the Pure Water Gazette.